Below are some details of rides we may do. See What's On for the Calendar of Club Events, or make a suggestion and round up some Ducatis for a ride, it's not hard to do if the sun's shining! We usually meet 8:45am for 9am-ish departure (unless rain prevents). Departure points vary depending which direction we are going. Those at the departure point get to make any changes they like for whatever reason, and sometimes they do! North: BP Beresfield - at the top end of the F3, coming from south turn right at the roundabout and it is 100m up on the left. Notorious for having a HP "monitoring point" opposite if coming from the other direction, but usually later in the day! East: Speers Point Pool, OK so we can only go out The Bay from here, but it works - just remember to fill up first please! Check the calendar detail as the time sometimes changes for particular events to fit in with other needs. Whatever it is you can be sure you will be going somewhere nice and in the company of friendly like minded people who love to ride their Ducatis, or they want to one day if they don't have one yet. All are welcome and there is no club charge, you don't have to be a member (until you want to be). We mostly adopt a ride practice of waiting at turns - this gives the faster riders a bit of a rest, and allows others to catch up at their own pace with no worries. We may sometimes use corner markers and / or tail riders depending on group size / destination / whatever, but the main thing is to ensure that everybody has a good time riding in the company of others. Comment: Just noticed (Feb 2011) that Dog Trap Rd had only 600m of unsealed left on it in 2008 per Google Earth, it is bound to be completed by now. So this means the last 12km of F3 can be cut out as this road connects Ourimbah with Somersby, arriving at Wisemans Ferry Rd - check it out! Berowra Loop: from Belmont South Shell via Toronto, Morisset, Wyee, Central Mangrove, Old Hwy, Pie in Sky, Berowra Waters, Wisemans Rd, home. Bulahdelah: It is always nice to have a doddle up the old highway just north of Bulahdelah, and late summer is the best time of the year to do it. This is 148km so a nice easy one! It is not too hot and the likelihood of moss is low. Typically the road is pretty clean AND dry, both important to enjoy this wonderful, free flowing but hardly used piece of the National Road system. Go via East Gresford, Dungog, Stroud and Booral, have a break at the servo at the beginning then a sighting run to Wootton first, and a repeat run for many before lunch in Bulahdelah. Catho Pub: via Broke, Wollombi Tavern, Laguna, Kulnura, Bumble Hill, Yarramalong Valley, back road to Doyalson and lunch at the famed Wallarah Hotel. This will be a relaxed laze around listening to the live music out the back in the afternoon, then make your way home when you can't take it any more (as if!). Concours d’ Elegance: Come and drool over Sydney’s finest collection of Ducati Motorcycles in one place at the Ducati Owners Club of NSW Annual Concours d’ Elegance. Held typically third Sunday in September in the grounds of the Moorong Spinal Unit, Victoria Road, Ryde. Food and drinks will be available, plus trade stalls and other planned events. Bring out your bike and show Sydney what owning a Ducati is all about. For full details visit http://www.docnsw.org.au/events.shtml. This is a 137km trip from Belmont South Shell taking the Somersby exit and travelling the Old Pacific Hwy ("The Old Rd"). Get back on F3 just after Berowra, take Pacific Hwy exit (ie veer left just before the end) then right on Ryde Rd which becomes Lane Cove Rd, keep following to just past Ryde and turn left to Morrison Rd, in 0.5km you are at the hospital, if you know the internal shortcut you will go in at the entry on the top of the hill, otherwise just go round the front. Denman: From Freemans it is a 176km ride going via Sandy Ck Rd, Millfield, Wollombi Tavern and a stop at Broke for refreshments, travel about 2 km and turn left, which brings us to the Putty Rd, a quick right and left onto the Golden Highway to Jerrys Plains where we head west and take the scenic back road into Denman with a run round that cool circuit that is Rosemount Winery on the way in. Do join us, it is a nice pub and meal at Denman watching the passing parade / goings on. Five (or Four if you must) Ferries: This is a brilliant day out, often in May with our NSWDOC friends, we always love it. It means an early-ish start but well worth the trouble. NSWDOC departure time is 9am from the Mobil servo at Berowra and we work our way round the Berowra, Lower Portland, Sackville, and St Albans Ferries. In previous years we would have lunch at St Albans Hotel or Wisemans Ferry for those that just want to ride as far as the short stretch of dirt and go back to Wisemans. The St Albans lot normally return to Wisemans Ferry to regroup with the dirt averse where the NSWDOC will go home via Mt White and we can join them if we wish, or more likely just take the short way back via Yarramalong and Wyee. Forster Loop: Basic route will be the back way through ClarenceTown to Booral then Bulahdelah, Forster, Nabiac, Plough Inn Bulahdelah. It is less than 100km back to Newcastle via the highway. See here for more details: http://hunterdog.org.au/DiscussionBoard/index.php?topic=674.msg1866#msg1866. Gresford: via Clarencetown and Stroud Rd to circle back to Dungog (and pick up that lovely Stroud Hill Road) to grab a bit of fuel, then down the very enjoyable Bingleburra rd to East Gresford pub for lunch. Back home via Paterson and that charming back road via Paterson, Hinton, Morpeth, Duckenfield, Scotch Ck Rd (don't miss the turn! ), Woodberry and Taro. This back way is always a surprise to people who see it for the first time, much better than the slog through Maitland - and at only 83km shorter too! Lake StClair: for a stroll about the foreshore, maybe an ice-cream from the kiosk, then back to Singleton for lunch. Need to tell the gatekeeper we are not staying, just doing a loop of the observation road and leaving. Lap of The Lake: Magical Lap of The Lake, Belmont South Shell start; a leisurely magical mystery tour lap of the beautiful Lake Macquarie. We will start with a quiet tootle round the Valentine bends, round Speers Point and a small detour up the hill at Teralba and back through Fassifern to bypass most of Toronto and then take in the delightful peninsulars of Rathmines / Fishing Point, Wangi Point and Bonnells Bay / Bardens Bay, bypassing the magnificent (but now locked) Morriset Psychiatric Hospital to stop for a coffee at McDonalds Morriset. Then a cut-through the countryside of Mannering Bay, a quick check of the bush in the Munmorah Conservation area (let the gatekeeper know we are travelling through and there is no fee), a run through Catherine Hill Bay and then a loop of magnificent old Swansea before returning to Belmont 16 footers sailing club for a lovely Ducati (Chrissie?) lunch listening to the fine music on the Deck most Sundays from 12:30pm. 140km total. Lostock Dam: via Buchanan, Hinton, Martins Ck and East Gresford, return to Gresford Pub for lunch. Nabiac National Motorcycle Museum: via Buchanan, Hinton, Clarence Town, Booral, Bulahdelah, Wootton and Nabiac for lunch. Nelson Bay: a nice little ride after New Years celebrations, leave from Speers Point Pool via the back of Teralba to Wakefield Drive and get some early corners in to check if everyone is awake. Then Lenaghan's Drive, past the old speedway at Tomago, the natty little cut through to Bobs Farm and wind up at the Fingal Bay pub for lunch. Old Rd (Pacific Hwy): via Broke, Wollombi Tavern, Laguna, Yallambie, Bucketty, Kulnura, Central Mangrove, Peats Ridge and on to the Old Pacific Highway Mt White Cafe for lunch. Patonga: An easy paced 156km ride and a beautiful day out. 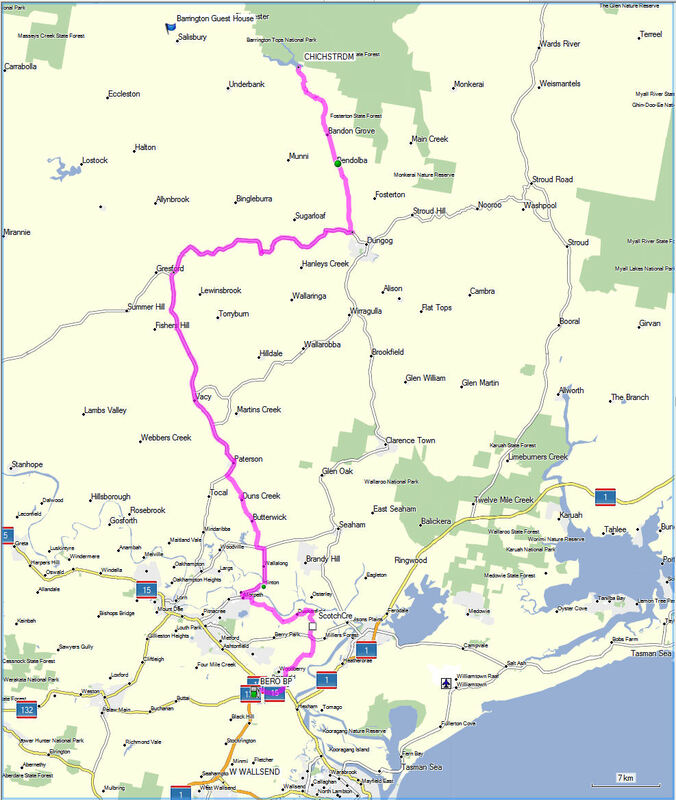 From Belmont Shell up the highway to Doyalson then the scenic back roads through the lovely Yarramalong Valley and up Bumble Hill to Mangrove Creek Dam (82km). After a rest at the dam to check out the water level we head down Peats Ridge to the top of the old road and work our way through Brisbane Waters National Park via Kariong, Umina Beach, past the Pearl Beach turn off and down to the little beach at Patonga (74km) for a fish 'n chip lunch, and the trip home to Newcastle is 109km going up the coast. Paterson: A leisurely ride through the country to Paterson to the bottom pub for lunch. Freemans via Sandy Ck Rd to Wollombi, head towards Pokolbin but turn left on Hermitage Rd, right at New England Hwy and left in 7km at East Branxton towards Elderslie, follow through Stanhope & Maitland Vale then left on Tocal Rd to Paterson. See "Gresford" above for return details. 163km out, 60km return. Pokolbin Loop: From Belmont south Shell head down to catho, then on to Morrisset via Rutley's road, over the gap, Sandy ck rd to Cesnock and out to Pokolbin for lunch at Robin Draytons (Macdonalds rd). From there to Branxton and out to Elderslie coming in at Bolwarra Heights. Maybe to Paterson and then back via Woodville Seaham Raymond Terrace and home. Putty Rd Half Way House: via Broke, Milbrodale, Howes Valley & Putty Rd Half Way House. A nice relatively short day out in the sunshine to do that magic top ten miles, and after the sighting run is done and a short break at the top bbq turnaround area the keen ones will go back for another loop! Singleton pub for lunch and the back way to Lochinvar home. 188km out (+30km if keen), 81km back to Newc. Alternately, lunch via Wollombi Tavern, then Laguna, Freemans Waterhole and home. "The Circuit": via Broke, Milbrodale, Howes Valley, Putty Rd Half Way House, Colo Heights for Lunch, Windsor, Lower Portland, Stanley Point, Wilberforce, Box Hill, Dural, Galston Gorge, Hornsby and Old Pacific Highway to Mt White Cafe for lunch, unless we feel the need for food earlier! 306km out, 100km back to Newc. Thunderbolts Lookout: via East Gresford, Dungog and Stroud Rd, return to Gloucester for lunch. 210km out, 176km back to Newc. (120km from Gloucester). Wingham: via Buchanan, Paterson, Dungog, Gloucester, Krambach, Burrell Creek and Wingham for lunch. Wisemans Ferry via Putty: from Freemans go via Sandy Ck Rd, Cessnock, Oakey Creek Rd to Broke, Milbrodale, Putty Rd Half Way House, Colo, Wisemans for lunch, return via Yarramalong Valley (see 2 Ferries below). 227km out, 130km home. Wisemans Ferry via "Two Ferries Ride": from Belmont South Shell to Doyalson, turn right to Wyee down Hue Hue Rd, right at end towards Yarramalong but quick left down Old Mauitland rd, through Kangy Angy and Ourimbah, Dog Trap Rd, Somersby, Old Rd to Berowra where turn right to Berowra Waters ferry, follow to Arcadia where turn right at Wylds Rd (if miss it you do a few more km via Galston & Middle Dural), then right up Old Northern Rd to Wisemans Ferry for lunch. Return is continuation on Wisemans Ferry Rd to Mangrove Mountain, veer left on Bloodtree Rd and left at end on George Downes Drive, then right in 3km on Springs Rd, down Bumble Hill, right at Yarramalong and either left at Hue Hue Rd or F3 home;170km out, 130km home. Wisemans Ferry via Yarramalong: from Freemans get on F3 and do the first 10km to Mandalong exit to avoid all the little towns. Then turn right on Hue Hue Rd, right at end to Yarramalong, left there up Bumble Hill Rd, left at end on George Downes Drive, right in 3km on Bloodtree Rd, right at end on Wisemans Ferry Rd then ferry then lunch. Return same way, trip is 120km out. Wollombi Tavern: South route via Yarramalong Valley, Mangrove Ck Dam, Bucketty and Laguna is 125km. Or North route is via Sandy Ck Rd, Pokolbin and Broke which is all of 93km. Either are a beautiful ride through the country side with enough twisties and plenty of time to make any Ducati rider happy. Weekend Away Rides (alphabetical order, click on name for info). Do save the dates and tell anyone else you have important motorcycling business to attend to that weekend! Gingers Creek: via East Gresford, Dungog, Stroud Rd, Gloucester, Wingham, Taree, Lansdowne and Wauchope, return Thunderbolts Way. Murrurundi: via Dungog, Gloucester, Walcha (via Wauchope? ), Bendemeer and Fossickers Way, return New England with tourist stops along the way. Oxley Wag-It Weekend Away: First day via Gloucester, Wingham and the back road in (ie via Wauchope) to the Long Flat Pub before heading in to Port Macquarie, which should see us in town by early arvo to get settled in at the El Paso Motel. Or some may wish to pop out to Gingers Creek in the arvo depending how we're feeling, the weather, whether or whatever! Sunday will be a return ride to wag our DOG tails on The Oxley and Thunderbolts Way, which should get us home by mid arvo. Tamworth Powerhouse Motorcycling Museum: via East Gresford, Dungog and Stroud Rd, Gloucester, Walcha and Bendemeer, return Fossickers Way. Uralla / Bendemeer: via East Gresford, Dungog, Stroud Rd, Gloucester, Wingham, Taree, Wauchope and Walcha, return Thunderbolts Way. Eastern Ck races/track days: Run throughout the year. See here for more info. Thredbo Blues Festival: mid January. Ducati Turismo: Whenever it's organised, usually in autumn. NDR (National Ducati Rally): Whenever it's organised, usually in spring. Triumph Pt Macquarie Rally (good for a stir and nice folk to boot): Early Sept. You've gotta go via Thunderbolts and The Oxley again, tough life eh? Motori D'Italia (Lansvale, Sydney): Concourse de Eleganza by NSWDOC, Usually in September. Narooma Blues Festival: October Long Weekend and it is the best annual event of its type, they have good bunk style accommodation. Merriwa River Rally: 4th weekend in October. Norton Owners Club BIG Ride: (British, Italian, German) Run to Brooklyn Hotel - Commonly held first Sunday in July so is a convenient post AGM ride. Grafton Jacaranda festival: Starts last Sat in Oct but first Sat in Nov is the main parade. Sydney Bike Show: Around November at Sydney Olympic Park. Snowie Ride: Last weekend in November. Toy runs: Newcastle is 25km departing 10am usually first Sunday in December from Griffith Park Stockton and finishes on Newcastle foreshore, we would need to arrive before 9:30am to get a club group happening, its a great spectacle and well worth doing. Find a kid to chuck on the back and you'll make a life-long impression on them. Please add to these suggestions and feel free to stir your fellow club members into going for a ride, it's all good as there's no bad days with a Ducati in your life! Disclaimer: While we will try to take all care in organising these rides / events, we are just a group of friends going out for a ride. We accept no responsibility for your throttle twisting, faring scraping or possible road rash on the day whether caused by yourself, others, or environmental factors. It is up to you to ride within your capabilities and safe limits at all times. The Organisers, Office Bearers and Members of the Hunter Ducati Owners Group NSW Incorporated do not accept any responsibility for accidents, injuries to riders, pillions, drivers, passengers, possessions and vehicles at, or while travelling to and from Club events, or any consequences arising from the same. You are totally responsible for your own choices and actions. This includes being aware of your skill level and ensuring you stay within safe limits appropriate to your knowledge and skills or lack thereof, regardless of the actions of others that may suggest otherwise. If you need to take a break it is your responsibility to be aware of that and do so regardless of what others may or may not do. If you get lost for any reason it is your choice and responsibility to remedy the situation safely should you choose to do so. Should unexpected hazards / situations arise these are solely up to you to deal with, including any consequences thereof to yourself, pillion, your property and that of others, in accordance with the laws of the land as applicable to a private citizen. The club cannot and will not provide or be expected to provide assistance beyond that which individual private persons are prepared to personally provide with good intent, but no warranty as to the fitness or suitability of any assistance provided is given or to be assumed.